DMS-05372 NIMS/HICS 2014 76-Position Hospital Incident Command Vest Kit All Disaster Management Systems' HICS Kits are the only kits that are shipped ready to deploy as soon as you receive them. Not just a bag of vests, every position vest is shipped with position responsibility sheets on clipboa..
DMS-05799 - SRS™ 7 Position Surge Response Go-Kit for Receivers/Hospitals Surge Response System 7 Position Go-Kit Made in the USA! Compact Kit Provides Full Patient Accountability within a Hospital/ First Receiver Surge HICS 2014 Compliant The New Standard for SURGE Management. 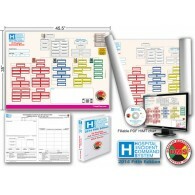 ..
DMS-05816 SRS™ SURGE RESPONSE SYSTEM Instructional Flip Chart for Hospitals/Receivers Use this handy large flip chart to train hospital/receiver personnel the SRS method of triage, tracking, and transport within minutes. Printed on Durawrite™ Synthetic Waterproof card stock. Practically indestruc.. Convenient DMS-06077 SRS Go-Kit Refill Package for Hospitals Includes: • DMS-05769 Triage Count Worksheet Refill Pack of 5 • DMS-05800 Casualty Care Unit Leader Count Form Refill Pack of 5 • DMS-05768 Triage Tag Receipt Holder Refill Pack of 6 • DMS-05767 Transportation Receipt Holder Refill .. The DMS Hospital Surge Response Kit™ was created to expedite and simplify the basic staffing requirements necessary to effectively handle the convergence of patients in the aftermath of a mass-casualty or WMD event upon a fixed medical facility. The Surge Response Kit now includes our SRS Surge..
DMS-05425 - HICS 2014 Command Board Deluxe Toolkit 76 for Large Hospitals Designed with the large hospital in mind. An important piece in the quick deployment of HICS positions. Companion piece to our DMS-05372 HICS 76 Position Vest Kit. A Total Solution for HICS 2014 Compliance: .. The DMS HICS 2014 Hospital Incident Command 26 Position Vest Kit™ supports a monumental effort by the HICS National Working Group, the National Integration Center, and the Emergency Management Institute in providing medical facilities nationwide with a truly flexible command structure that meets the..
DMS-05424 - HICS 2014 Command Board Deluxe Toolkit 26 for Smaller Hospitals Designed with the large hospital in mind. An important piece in the quick deployment of HICS positions. Companion piece to our DMS-05312 HICS 26 Position Vest Kit. A Total Solution for HICS 2014 Compliance:.. 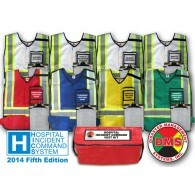 Updated HICS 2014 Fifth Edition 8 Position Command Vest Kit for Small Hospital All Disaster Management Systems' HICS Kits are the only kits that are shipped ready to deploy as soon as you receive them. Not just a bag of vests, every position vest is shipped with position responsibility sheets on ..